A necessary, freeing essay about the way we think about AIDS, and a sequel to Sontag's ten-year-old Illness as Metaphor. Behind the earlier book lay the fact that Sontag herself had won through a two-and-a-half-year illness with cancer, and come out against gloomy doctors and unhealthy terms used to describe cancer. Much of her attack here on language commonly used to describe AIDS seems at first merely artful, and the reader treads words waiting for something to happen. Does something happen? Well, we find out that using military metaphors to make AIDS plain only makes it more alien: " 'other,' as enemies are in modern war; and the move from demonization of the illness to the attribution of fault to the patient is an inevitable one"; "Cancerphobia taught us the fear of a polluting environment; now we have the fear of polluting people that AIDS anxiety inevitably communicates. Fear of the Communion cup, fear of surgery; fear of contaminated blood, whether Christ's blood or your neighbor's. Life--blood, sexual fluids--is itself the bearer of contamination." AIDS, Sontag avers, extends our inurement to the sense of global annihilation fostered by nuclear arms. It is one more apocalypse, "like the astronomical Third World debt, like overpopulation, like ecological blight. . .Apocalypse is now a long-running serial. . ." Apocalypse-mongering about AIDS, however, only enforces stereotypical thinking, inflicts stigma, suggests the need for state sponsored repression: "We are not being invaded. The body is not a battlefield. The ill are neither unavoidable casualties nor the enemy." Not consoling, not inspiring, not really moving, none of which does it mean to be. 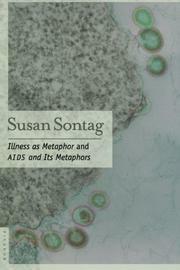 And yet Sontag's truth-telling about words blows away myths that darken our attempts to understand the as-yet ungraspable about AIDS.